With over 600 miles of rights-of-way, walkers on Exmoor are spoilt for choice. Walk across wild open moorland, stroll along hidden valleys, hike high hills, forage in ancient forests or meander alongside burbling streams and rushing rivers. Perhaps explore Lorna Doone country or the Coleridge Way or enjoy the spectacular coastal vistas along the South West Coast Path. Exmoor is beautiful in all seasons and weathers - a land of light and mystery! Since it's a living and varied landscape, each season has a different ambience and spectrum of views and colours. Exmoor National Park maintains its 600 or so miles of rights-of-way in excellent order, with coloured squares or arrows for waymarking. Paths are never crowded; there is plenty of space for peace and quiet, and freedom from noise, pollution, crowds and traffic. 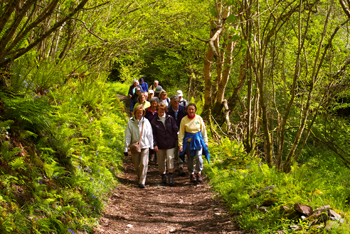 By exploring on foot you really enter into Exmoor and experience a different world - reminiscent of bygone eras, switch off, relax and have time to notice its wildlife and flowers, and each other. You don't have to be an ardent walker to enjoy Exmoor, and you certainly don't have to walk far to enjoy some of the best views the area has to offer. There are lots of well-signposted trails and literally hundreds of routes to choose from. Whether you're looking for a village stroll, a coastal walk or to wander the moors Exmoor has something for you. The Tall Trees Trail at Nutcombe Bottom is great for all abilities and is wheelchair and pushchair accessible too. With interactive interpretation along the way it is a great introduction for younger walkers and gives you an opportunity to discover England's tallest tree! The popular beauty spot of Tarr Steps sports a great 2-mile waymarked circular walk along the River Barle, through a National Nature Reserve with some of the finest riverside woodlands you will ever find. Dunkery Beacon may be the highest point in all of Somerset and Exmoor but it is easily accessible and can be walked by most abilities with ease. Wistlandpound Reservoir offers an easy disabled-access 2-mile route around the picturesque lake. There are numerous walks from easy access trails to more challenging walks available on the National Park Website and you can purchase local books and walking guides at information centres, where staff are on hand to help you plan your route. Alternatively, grab the Ordinance survey OL9 Leisure Map for Exmoor and plan your own routes. Walking with a Ranger, knowlegable guide or volunteer is a great way to immerse yourself in the stories of hte landscape - find out more here. If you really want to escape the routine of everyday life little will beat a multi-day walk. A sense of challenge, the experience of a journey and some of the most varied and stunning scenery around are the perfect ingredients. You can, of course, plan your own route through Exmoor but there are a number of waymarked promoted routes that cross the area giving you an experience to last a lifetime. Further details and videos on thes routes can be found here. At 630 miles it's the longest in the country and it starts by traversing the rugged coastline of Exmoor (36miles). Walk in the footsteps of the Romantic Poets. The Coleridge Way offers a fantastic introduction to long distant walking spanning 51 miles between Nether Stowey on the Quantocks and Lynmouth on the Exmoor coast. Two moors, two coasts and over 100 miles of breathtaking scenery! The Two Moors Way links the South West's two National Parks, and can be extended to form a Coast Coast route too. Starting way up high on the moorlands of Exmoor all the way to the mouth of the River Exe follow the river on its journey from Moor to Sea. However prepared you are for your long distance walk, the unexpected can happen to the best of us. For information on what to do in an emergency go to http://www.exmoor-srt.org.uk/index.php/advice.